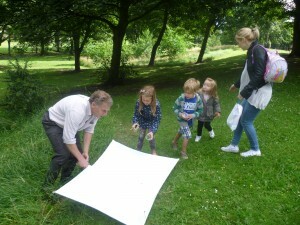 As part of our increased awareness of the bio diversity and the cemetery, as a place to visit, we held 2 Mini Beast Hunts at the start of the school holidays, facilitated by Hartlepool Borough Councils Ecologist Ian Bond and supported by Hannah Woodhouse from the Countryside Team. Approximately 50 individuals which, included parents, teachers, support workers and children from Jesmond Garden Primary School, the Wharton Annex along with others participated. The groups which had sat patiently listening were sent off in all directions into the wilds of our long grass patches with a net, artists paint brush or specimen jar which had a magnifier attached and to the lucky few the use of a beating net (white square cloth which opens up). Popular beasties that were discovered varied greatly from spider’s, caterpillars and butterflies to the bugs and insects which live in the undergrowth or clung to the leafy branches. 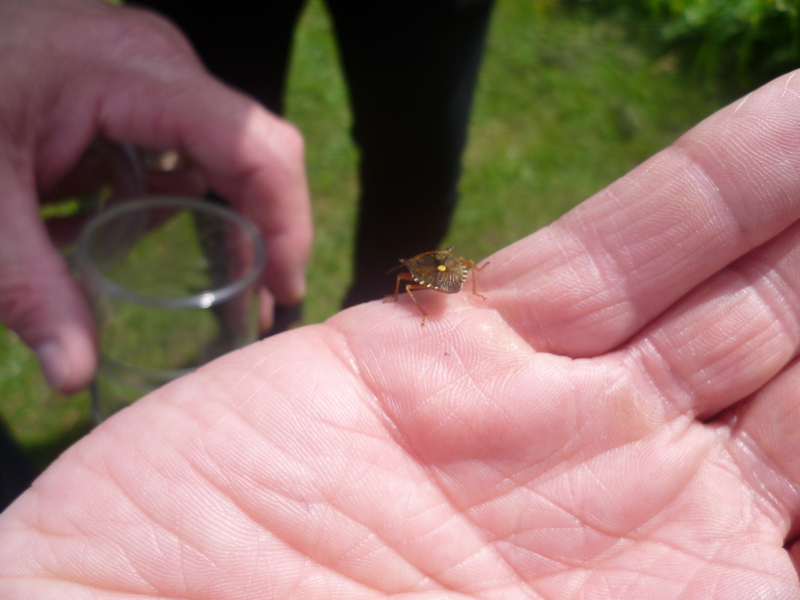 One interesting beastie captured by one student was a “Red Legged Shield Bug” which Ian was happy to place on his hand to show everyone and tell his keen students about it. 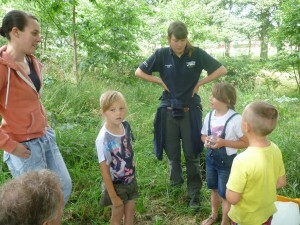 Mum Adele Commented “What a great activity it was and the children thoroughly enjoyed getting to know the cemetery a bit better! The activities were made all the better as a result of the glorious sunny weather we had. What did I catch you might well wonder! For my part at one activity, I collected hay fever and had to stand there looking silly with itchy runny eyes getting redder and redder, runny nose coupled with bouts of sneezing. I did look like a beastie so to speak! I’m just so glad nobody thought to take a photograph of my dismay! I hope.